Viburnums are bark medicine and now is the time to harvest medicinal barks. Here’s a monograph of the medicinal Viburnums. Enjoy and happy harvesting! Viburnum is a widespread genus of shrubs and small trees. There are a variety of viburnums that are used around the world and in the United States for food or medicine and many sub-species of Viburnum that are used in landscaping. About fifteen native species are found in the United States and four native species grow in my home state of Minnesota and there is one non-native naturalized species (Smith, 2008). In this article, we’ll be exploring the medicinal species that are in widespread use, commonly called Black Haw, Cramp Bark and High Bush Cranberry. 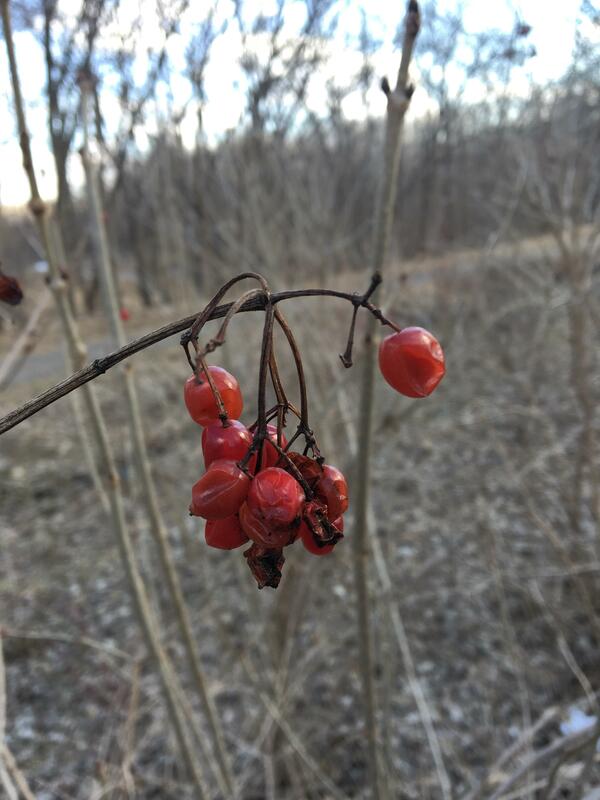 One Viburnum species found in Minnesota, Nannyberry (Viburnum lentago) is not used for medicine but produces sweet, edible, nutritious berries that can be foraged. (See Sam Thayer’s work for a good account). There’s a lot of confusion surrounding the common names within the Viburnum genus and which ones are used in herbal medicine. The two primary medicinal species of Viburnum are Viburnum prunifolium, commonly called Black Haw, and Viburnum opulus, commonly called Cramp Bark by herbalists. Gardening books may refer to V. opulus as Guelder Rose or High Bush Cranberry or European High Bush Cranberry. I’ve created a table below for clarity. V. prunifolium doesn’t grow in the northern states like Minnesota but V. opulus does. V. opulus is a plant of European origin that is widely naturalized in the United States. As I mentioned above, we also have four native species in Minnesota. 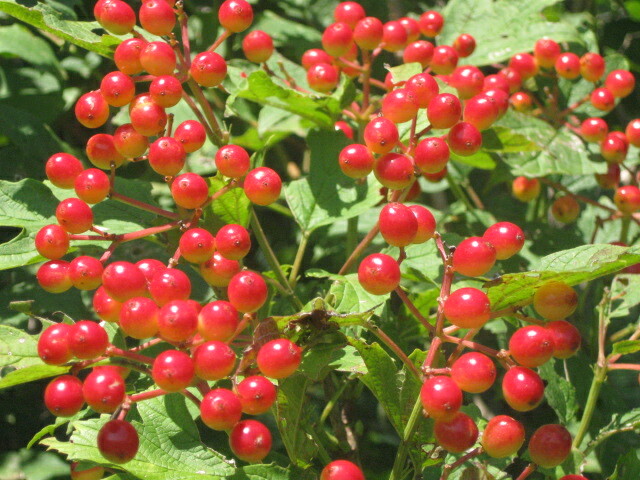 The one you are most likely to encounter in the Twin Cities area is V. trilobum, commonly known as High-Bush Cranberry. Wait! Didn’t I just say that Viburnum opulus is called High Bush Cranberry? Yes, I did. It is certainly confusing. Common names are getting thrown around all over the place and applied to multiple species. This example illustrates why it’s important for herbalists to learn scientific names as well as local common names, so you know what plant people are talking about. The confusion is compounded because many herbalists will use V. opulus and V. prunifolium interchangeably, although some will have a favorite or offer specific indications for one species over the other. And the cherry on top of the confusion sundae: some botanists consider V. trilobum and V. opulus to be so closely related as to be considered one species. I have found that Black Haw, Cramp Bark and High Bush Cranberry all work wonderfully for the same sorts of symptoms and indications, therefore I treat all three Viburnum species: opulus, trilobum and prunifolium as virtually interchangeable. Just note that when I mention Cramp Bark, I am referring to both V. opulus and V. trilobum and when I mention Black Haw, I am referring to V. prunifolium. 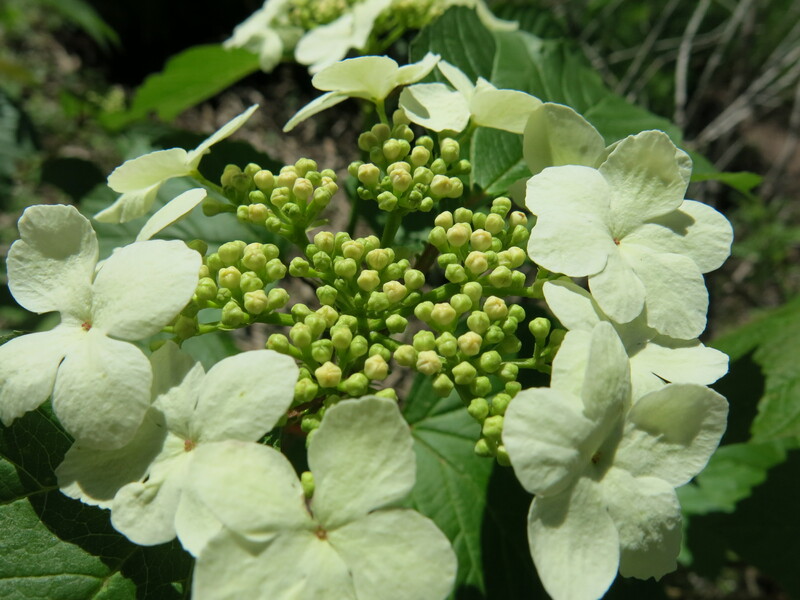 Minnesota’s medicinal Viburnums are beautiful cane-bearing shrubs with a graceful vase-like shape, maple-like leaves and flat clusters of creamy flowers which look a bit like those of hydrangeas. The flowers give way to bright red berries that are quite sour and clearly the inspiration for the name high bush cranberry. One or two of these berries are fun to nibble on but nothing most people would want to eat by the handful. I was recently teaching a group of students about Viburnum tribloubm and we passed around the overwintered berries to taste. One student said that they smelled and tasted like wet dog. Other students, disagreed and thought they were delicious. Sources commonly state that Viburnum berries are consumed by birds but in my experience and anecdotes from others with Viburnum on their properties, this is rarely the case. Many of us find Viburnum berries still hanging, shriveled, on the branch in late winter and early spring. While the birds will clear the fruit off Elderberry, Hackberry and Cherry trees, the Viburnum berries remain. Viburnum is primarily women’s medicine with a specific affinity to the smooth muscle of uterus, but it also has some effect on the vascular system, the nervous system and the muscles of the limbs. As the name, Cramp Bark suggests, Viburnum is used for cramping, which is a just a casual term for uterine contraction. Uterine contraction/cramping during menstruation is common and for some women can be very disruptive to their lives. Uterine contraction also occurs during pregnancy in the form of threatened miscarriage, pre-term labor and normal, healthy Braxton-Hicks contractions. The uterus contracts strongly to accomplish birth and it continues to contract during the first few days postpartum as the uterus involutes (brings the organ back to a smaller, pre-pregnancy size and state). The Viburnums are highly effective at sedating the uterus and relieving menstrual cramping. This is especially true for women whose menstrual cramps are extremely painful and debilitating. This herb is great for when the cramps are not just centered in the lower front pelvic area but radiate around the back and down the thighs and may even cause painful cramping in the bowel. In my practice, I work exclusively with Cramp Bark, not using Black Haw at all. I have not found Cramp Bark to be curative for cramps, but it does provide effective symptomatic relief, relief that is at least as effective and dependable as over the counter pain medicines. Doses of Cramp Bark tincture should be large to use Viburnum in this way, about 1 drop per 3 lbs of body weight. You can, of course, play around with lower doses. Doses can be repeated as needed. It takes about 15 minutes or so to kick in and provide relief and relief typically lasts a few hours. Cramp Bark is an extremely safe herb with no toxicity concerns associated with its usage. (In fact, dosage ranges quoted by authoritative sources range up to 30 mls a day for 1:5 tinctures. A 1:5 tincture is a tincture that is made from 1 part plant material to 5 parts menstruum, alcohol usually. 1:5 is a common ratio for bark tinctures). The literature on Black Haw tends to include a few more cautions than Cramp Bark so readers who choose to use Black Haw should consult trusted references about doses. Mills and Bone, listed in the references below is one of my favorite text sources for safety information. Cramp Bark stops contractions and is used for threatened miscarriage, premature labor, dysfunctional prodromal labor that needs to be stopped for some reason and even bothersome Braxton hicks contractions that are interfering with work or family life. I have assisted a number of women in my practice to stop contractions. Miscarriage is frequent and the causes are myriad including embryo or fetus with anomalies incompatible with continued development, maternal low progesterone, or blood clotting disorders, structural or cervical issues and more. Herbs cannot halt all miscarriages, many are inevitable but they can help women with a tendency to miscarry either by calming the over-active uterus and stopping contractions. They can also set the mind at ease when there is lots of cramping in early to mid-pregnancy but no bleeding. In habitual cases it is necessary to give the agent in occasional doses for one, two or more weeks preceding the time of the miscarriage, which usually occurs each time at the same month of the fetal life. As the time approaches the patient is kept quiet and free from excitement, and the agent is given three or four times daily. The interval is shortened to one or two hours with the first suspicious indications at the usual time. If no symptoms appear the agent is continued beyond the period, and then perhaps in daily doses only for a week or two longer. The physician should advise the patient to remain constantly on the watch for indications suggesting the necessity of an increase in the doses. The agent will stop induced miscarriage, as well as other forms, if no injury has been done to the membranes. Several years ago, I worked with a woman who was pregnant with twins and planning a natural homebirth. She was plagued by contractions from rather early in her pregnancy. She was in and out of the hospital two times from 22 weeks-30 weeks for preterm labor and treatments like steroids for fetal lung development and magnesium sulfate to stop the contractions, monitoring and testing. To be honest, early on in this process I wasn’t even considering herbs. I thought there was nothing that would stop this preterm labor train. But this mom was determined to have her babies at home and naturally. She was on complete bed rest at home. Contractions would commence in the evening. When she stood even briefly to take a shower the contractions would increase and there would be strong sensations downward pressure. Around 30 weeks we began a regimen of Valerian and Cramp Bark, bout 1 ml of each at night. Then she would take 1.5 mls of Cramp Barks throughout the night, evey 90 minutes or about 3-5 times nightly. She did not return to the hospital after commencing the herbs and She carried her babies to term and had a beautiful homebirth of two healthy baby girls. On another occasion, I worked with a woman who had prodromal labor. The contractions caused pain and sleeplessness but were not progressing to active labor or resulting in dilation. If that weren’t enough, she and her husband were sick with upper respiratory infections. She began to use a combination of Valerian and Black Haw and effectively stopped her labor, slept and recovered from her illness. After which she stopped taking the herbs, labor recommenced in a very normal and straightforward way and she had her baby less than 24 hours later. This whole process was over a ten day period. Recently I worked with a woman planning a homebirth with her second baby. Her first baby had been born prematurely and she had many fears about the possibility of this happening again. Painful contractions began around 34 weeks gestation, about 3 weeks before we could safely attend her for a homebirth. Some of the contractions were strong enough to wake her from sleep, worse in the morning and at night, felt in the front and the back and coming frequently. She felt that she could only be upright and walking around for about 30 minutes after which contractions would commence. I recommended calcium and magnesium supplementation and Cramp Bark. My client reported that her contractions were kept at bay if she took the Cramp Bark consistently. She went on to birth at 38 weeks and 3 days gestation, a very swift and beautiful birth. This type of use is very consistent with historical practices and those of contemporary midwives. The Viburnums really stand out as remedies to relieve prolonged, early-stage non-progressing labor, called prodromal labor. Viburnum is also a popular remedy for after pains. The uterus contracts after the baby is born to clamp down, stop the bleeding and to help the body expel the placenta. The uterus also continues to contract over the next few days as it begins its process of involution and to reduce bleeding from the placental site. Most first time moms and many second-time moms either don’t notice these contractions or may notice only mild discomfort especially while breastfeeding. However, the more babies a woman carries, the uterus becomes increasingly distended and these contractions can be very painful. Some women describe them as worse than labor. Cramp Bark and Black Haw effectively relieve these pains. Viburnum tinctures can be used with standard over the counter pain relievers. If after-pains are particularly severe I will have moms follow a regimen that involves ibuprofen every four hours and Cramp Bark every four hours but staggering the doses. For instance, if ibuprofen were taken at noon and four pm, Cramp Bark would be taken at 2 pm and 6 pm. This type of regimen can provide safe and effective relief to a woman whose pains are so severe that she is miserable and unable to enjoy or focus on her new baby. Due to the non-toxic nature of Viburnum these tinctures are safe for breastfeeding mothers at high doses. The old-time physicians also believed that Viburnum in small doses, was an excellent partus preparator. A partus preparator is a medicinal agent given in preparation for birth. This is not common in modern medicine, but it does persist as a DIY practice in some naturally minded communities. The old-time docs also used it for post-partum hemorrhage when mixed with Cinnamon and Shepherd’s Purse, both circulatory stimulant hemostatics. They also outlined emotional and psychological indications for Viburnum. Viburnum “overcomes all forms of nervous irritation, and irregular functional action in these organs. It is the direct remedy for nervous conditions of the pregnant state”, wrote Ellingwood, the great obstetric writer of the Eclectic physicians. He went on to write that that Viburnum is indicated in “highly nervous women, overworked women. It is called for in weakened conditions of the body, with feeble performance of the uterine functions”. Viburnum, “changes the mental condition of the patient from that of depression and despondency, to one of cheerfulness and hopefulness” For this purpose I find Viburnum combines well with Motherwort. Viburnum is frequently used in formula for leg cramps in the night, a common occurrence of pregnancy. It should be noted that leg cramps are frequently caused by a deficiency of minerals especially magnesium and calcium or inadequate water intake. I can often be remedied by consuming more water and minerals. Viburnum is also used, typically in formula, to lower blood pressure. The body of remedies used to lower blood pressure in western herbal medicine is small and such a safe herb as Black Haw/Cramp Bark makes a welcome addition to our selection of remedies. Black Haw/Cramp Bark has unique energetics compared to most of the hypotensive remedies. Most hypotensives are cooling, bioflavonoid heat reducers like Linden, Hawthorn, Passionflower, or pungent, aromatic vasodilators like Garlic and Angelica. Black Haw/Cramp Bark seems to work throughout the body as profoundly relaxing to muscle. Viburnum demonstrated the ability to lower blood and heart rate in a study on dogs. Ruth Trickey reports that the leaves are sometimes used like Bearberry/Uva-Ursi for urinary tract infections due to a similar chemical profile. Mills and Bone report that Black Haw may be used for bronchial spasm and asthma, similarly to Lobelia. This effect is not reported for other Viburnum species. They caution that high doses may cause nausea and vomiting. I have no experience using Black Haw in this manner. Ellingwood, Finley. “Agents Acting on the Female Reproductive Organs.” The American Materia Medica..Therapeutics and Pharmacognosy. N.p. : n.p., 1919. N. pag. The American Materia Medica..Therapeutics and Pharmacognosy. Henriette’s Herbal Homepage. Web. 16 Mar. 2017. Mills, Simon, and Kerry Bone. The Essential Guide to Herbal Safety. N.p. : Churchill Livingstone, 2005. Print. Romm, Aviva Jill. Botanical Medicine for Women’s Health. St. Louis, MO: Elsevier, 2010. Print. Smith, Welby R. Trees and Shrubs of Minnesota: The Complete Guide to Species Identification. Minneapolis, MN: University of Minnesota, 2008. Print. Thayer, Samuel. The Forager’s Harvest: A Guide to Identifying, Harvesting, and Preparing Edible Wild Plants. Ogema, WI: Forager’s Harvest, 2006. Print. Trickey, Ruth. Women, Hormones and the Menstrual Cycle. 2nd ed. Crows Nest: Allen & Unwin, 2003. Print.